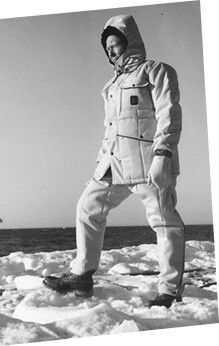 Discover the unique jackets of the Original 1954 Edition. The Original Blunt Jacket is an iconic bomber that has always distinguished our brand. Built externally with a fabric reminding the original jackets used by workers in the Meat Packing District of New York, this winter bomber jacket is resistant to rain and wind and will protect you in an essential way from all weather conditions. The internal padding is in ecological material and not bulky, but at the same time warm and comfortable. Garment equipped with all the necessary comforts: cuffs and bottom with rib knitting to better shelter from the wind, hood adjustable through elastic and with rain visor, two comfortable front pockets to store your belongings. Do not miss it, buy it today on our official website. This winter jacket is part of the Original 1954 Edition and is the perfect garment for those who like to dress up with an unmistakable and contemporary look. The Original Blunt Jacket is an iconic bomber that incorporates the characteristic features of the jackets used in the '50s and' 60s in the refrigerating cells of the Meat Packing District in New York. This bomber jacket is ideal to face the Autumn Winter 2018 season in the best way. Researched in every detail, our Original Blunt uses the vertical quilting technique typical of RefrigiWear garments, front closure with zip and logoed slider, inner lining in original RefrigiWear black/silver insulating and breathable mesh fabric. Built externally with a structured and full-bodied fabric, with a crisp touch, this winter bomber is resistant to rain and wind and will protect you in an essential way from all weather conditions. The internal padding is in ecological material and not bulky, and at the same time warm and comfortable. Garment equipped with all the necessary comforts: bottom and cuffs with rib knitting to better shelter from the wind, hood adjustable through elastic and with rain visor, two comfortable front pockets to store your belongings. Buy it today on our official website in Dark Blue and Black. All RefrigiWear items are to be treated with care; correct treatment will guarantee the maintenance of performance and appearance over time.